Hello ... I'm a new user. I don't have an Almond but I'm in the process of ordering one. In my new office location I have a FiOS connection coming in as well as XfinityWifi. higher bandwidth and/or better service availability ? or may be the XfinityWifi can be used as a "spill over" channel under overload conditions ? Re: Bundling of wifi+cable uplinks? Not with the Almond I'm afraid, but it might be possible with our upcoming model, the Almond+. That said, I presume the Xfinity Wi-Fi connection requires some kind of login via a web page? If so, then it's most likely not going to work as you want it, regardless of the router you pick. thanks. I would have loved to use Almond+ but seems it's few months out and I need something this week. a user connected behind the firewall/router: first access will result into a web redirect. After that though, no further re-authorizations would be required (well may be occassionally). thanks again on your feedback. Here I built a new router/firewall using PFSense for that almost same reason. The software is free. I am currently utilizing Smoothwall (free)which allows for multiple internal LAN connections but only one WAN connection unless you purchase the commercial version. I am looking to load balance two WAN ISP connections here. At another location today I do utilize FIOS and kept their combo AP,Firewall, switch and router in place. That said I just bridged a WAN link to a LAN link passing all to a DD-WRT router. But that isn't two ISP connections. Load balancing is tricky and tend to require quite expensive routers due to the fact that you tend to need multiple WAN ports. In the case of doing it via Wi-Fi, I really don't know of any commercial solutions that have a means of letting you access an internet connection that has a log-in page. I'm afraid I'm not familiar with how it works in your case, as I haven't tried the service, so it's hard to say, but if it's anything like most Wi-Fi services, I think you're out of luck regardless of what company you go with. I just got the Almond box and briefly tried it. apply to the uplink WiFi connection? or they only apply to a wired Ethernet uplink ? btw, I tried to set the Almond as an AP for Xfinity and it didn't work: it gets stuck on the "obtaining IP address". While I didn't expect it to work fully, I'm fairly sure that Xfinity does hand out IP addresses when you connect. a long while since I did that. May be will retry to confirm (or dis-confirm). PS: Pete thanks for the pointers to the opensource firewall/gateway options. We have two modes and in both cases it applies to the wireless connection. If you're using the standard Range Extender setting, then everything is handled by the main router like DHCP etc. If you're on the other hand using the Wireless WAN mode, all of this will be handled by the Almond. Note that this is still in beta. If you want to use Ethernet, we have a Wireless AP (Access Point) feature that makes the Almond turn off the DHCP server etc. and act as a simple access point, but you can for example still use the Ethernet ports if you need to attach more wired devices. Did you upgrade to the latest firmware? As I know we've had some issues with some routers, but I'll pass this on to our support team and have them have a look at it. What make/model router do you have? I did try the Wireless WAN mode as well. Is it correct that visually, the screens/progress is the same for Wireless WAN and for Range extender? is an indication somewhere that I missed ? access to it yet but I recall seeing a manufacturing/firmware date of around June 20,2013. Will check though and report back as soon as I'm in again. According to the support team, this is an issue with you using an older firmware, as this issue should be fixed in more recent versions. As the WWAN is a beta feature, I don't think we've implemented an easy way to tell the difference as yet, but I'll point this out to the software team, as it would make it easier to know what's going on. Here is a picture showing the latest firware revision level. 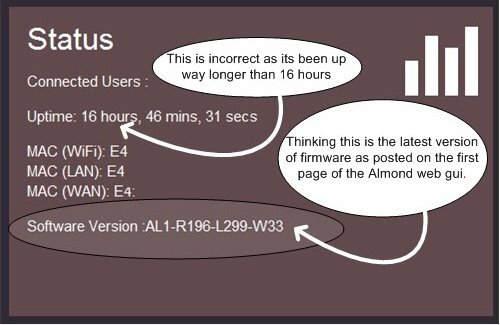 regarding the firmware version: the Almond device reports that the software is up to date. The current version shown is: AL1-R196-L299-W33. btw, right now I'm connected through the Almond that is connected to the hotspot network of my cell phone. So may be what you said earlier is the hard truth that Xfinity Wifi is doing something quirky. I setup the above pairing with my cellphone Wifi by using the Wireless WAN option. So I got connected ok. However, when I click again the Wireless WAN button, the title of the page is: "Range Extender"
As for the Wireless WAN feature, it's in beta for a reason but thanks for the info and I'll pass it on to the software team.